Phoenix, Arizona (June 18, 2015)– Banning Motorsports did their homework in the form of pre-running for this years SCORE-International Baja 500. It did more than paid off for the entire team as they finished the 500+mile race with a podium finish. 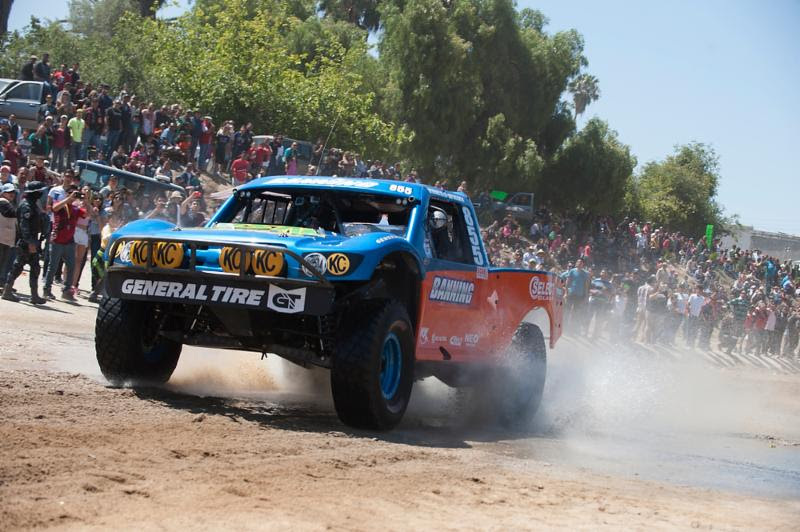 The Arizona based team headed south for the 46th annual Baja 500, but this year they would be doing it different by bringing down their new Geiser TT-Spec truck and racing Baja for the first time in the new truck. Days upon days of pre-running and planning all came down to race day where the #855 started off the line in Ensenada. The TT-Spec class started behind the big dog classes known as the Trophy Trucks and Class 1 race vehicles. This would lead to plenty of dust for the first driver of the #855 truck, Lee Banning Sr.
“From the beginning Chris Godfrey and I were on the gas and the truck was running flawless.”Stated Banning Sr. SCORE threw a curve ball into the course this year as they would run the course back towards the border. Team Banning was sure to know every mile and obstacle of the new route. Silt beds at race mile 50 were deep enough to swallow and capture numerous vehicles from the get go, but Banning Sr. stayed on the gas and never lifted as he blew right by stuck competitors. After racing through the pine forest and up to Mexicali, the truck pulled over for a quick fuel splash to insure that the new truck would make it to the next pit. “We are still figuring out details on the truck and running out of fuel was not an option.” Said Banning Sr.
Making their way down La Rumorosa grade which hands out over 20 miles of downhill switch backs, it was expected to run into hung up cars on one of the 3-point turns. After the line of race vehicles found a line around the stuck vehicle, the #855 was back on course and on their way through massive whoops and desert heat. 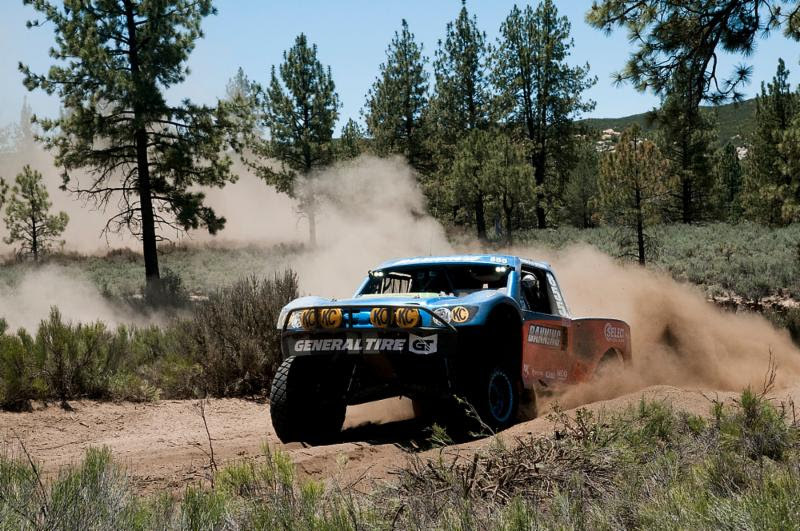 Just south of Laguna Salada, the team pulled into their main pit at race mile 225. Taking on 60 gallons of race fuel and quick driver change, Gary Williams Jr. took over driving duties. Williams Jr. had a flawless run south to Hwy 3 as he then started heading west back towards the Pacific. Ticking off the race miles the Banning team had realized that they made up many positions on the competition and as the truck pulled into race mile 370 they had another major pit stop as they would set up the KC HiLites Light Bar, take on even more fuel and do their final drivers change. Lee Banning Jr. left the pit in the dust as he took off to chase the rest of the competition. The course would change direction and head back North up the coast of Baja. Running right along the edge of land, Banning Jr. was at one point second place on the road. Running some of the roughest parts of the course would be mildly challenging for the team as they got stuck around race mile 449. A rain rut would put them behind briefly. 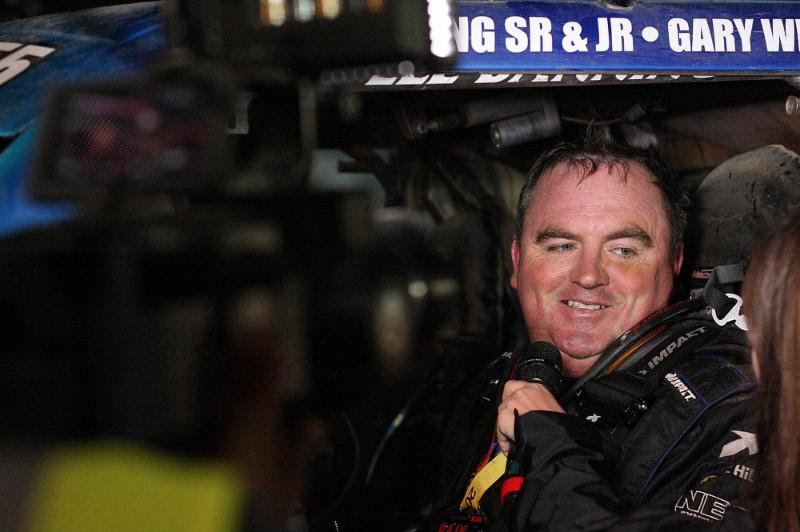 Teamwork between Banning Jr. and co-driver, Chris Godfrey, would get them unstuck and continuing onto Ojos Negros. Heading west on Hwy 3 again and back into Ensenada and across the finish line with a truck that still was ready to run another 500 miles. Banning Motorsports had a near flawless race with no flats on their General Tire Grabbers and as the team was all smiles at the finish line, they were happy to celebrate their 3rd place finish. The entire Banning Motorsports team has had a great year with their new truck and they look to continue crossing the finish line at more races in 2015. A huge thanks to all our sponsors, partners , team members and fans.